Marathon number 5 is in the books!! 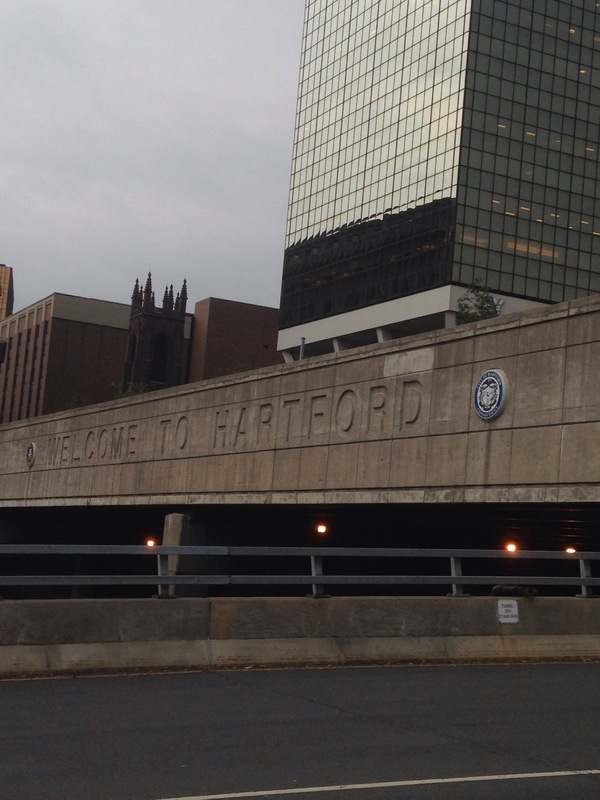 Hartford is only a 35 minute drive from my house and not a very exciting place to visit if you’re local. My friend Kate was running the half marathon so rather than bore our families with an early morning and long day in Hartford we decided to make it a girls road trip like we did last year for the Baystate Half Marathon. My excitement was really high. I was ready to run! 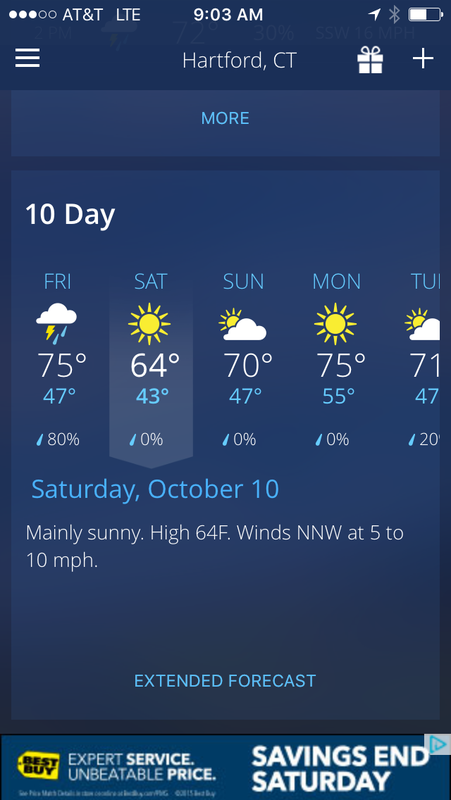 I had been checking the 10 day forecast like a maniac! It went from a rainy day to ideal running weather. Kate picked me up around 12:30 on Friday. We made it to Hartford in no time at all. We checked into our hotel and then hit the Expo at the XL Center in downtown Hartford. It was the best expo I’ve been to by far. The vendors were really friendly and extremely generous. Our favorite was Bakery on Main. We got to try some new flavors they are working on and got a bunch of free samples including two of their True Bars, the Walnut Cappuccino and Raspberry Chocolate Almond flavors. They were amazing! After the expo we went for a manicure. I got sparkly red to match the shirt I was going to run in the next day. Definitely not a color I would normally put on my nails, but so fun for the weekend. The manicure included an upper back and neck massage. Nice touch!! We had some coffee after while we killed time before the pasta dinner. Orlando and I went to the pasta dinner the night before the Vermont City Marathon. I had never been to one before. They are a little pricey for what I tend to eat, but the money goes to charity and it is a great way to get into the spirit, meet some new people, and eat exactly what I want to eat. We had fun chatting with the eclectic group at our table including one woman who lived in a neighboring town from us and would be performing her first Burlesque show later after running the half marathon. Brave soul!! We joked that we might show up with our cow bells. 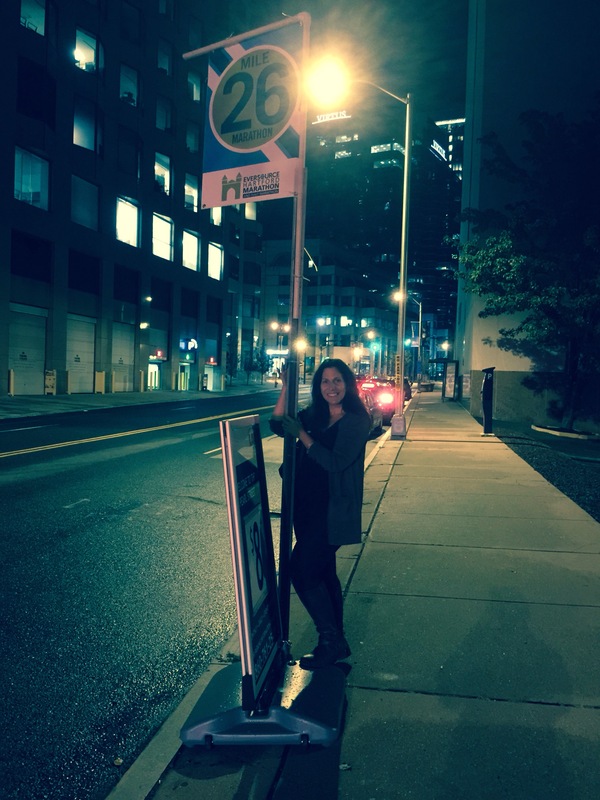 Pole dancing at mile 26! The Arches all lit up. This is where we will run through to the finish. Kate and I are not a wild duo so we were in bed by 10. We chatted. I added some new tunes to my playlist. We were probably asleep by 11. I woke up on my own around 5 and then tossed and turned until 6 at which time my marathon morning rituals began. Bathroom, shower, get dressed, eat (chia, oats, banana and a spoon of nut butter), bathroom, put bib on, bathroom… You would think after 4 marathons I wouldn’t be so nervous, but it’s the same feeling each time. We left the room around 7:30 to walk to the start area. 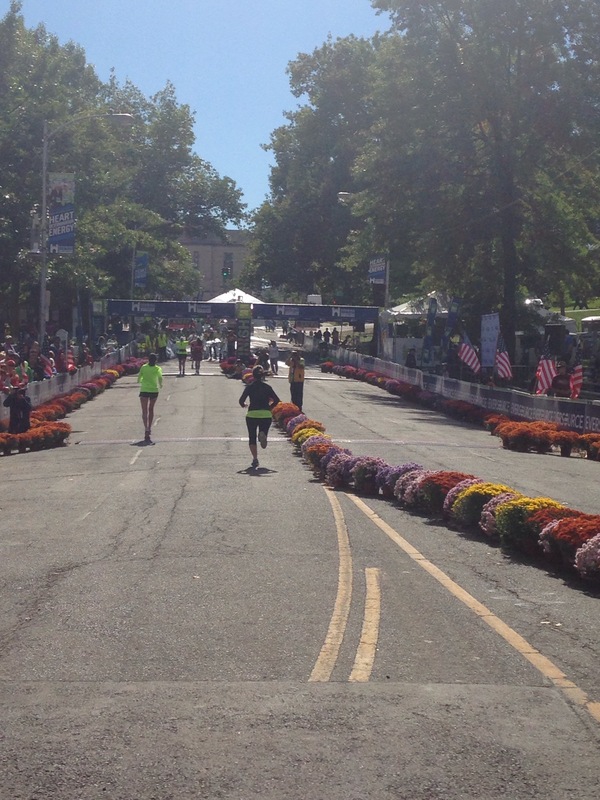 The Hartford Marathon and Half Marathon draws thousands of runners. It wasn’t difficult to find the start. The energy was awesome. So many people, so much excitement. 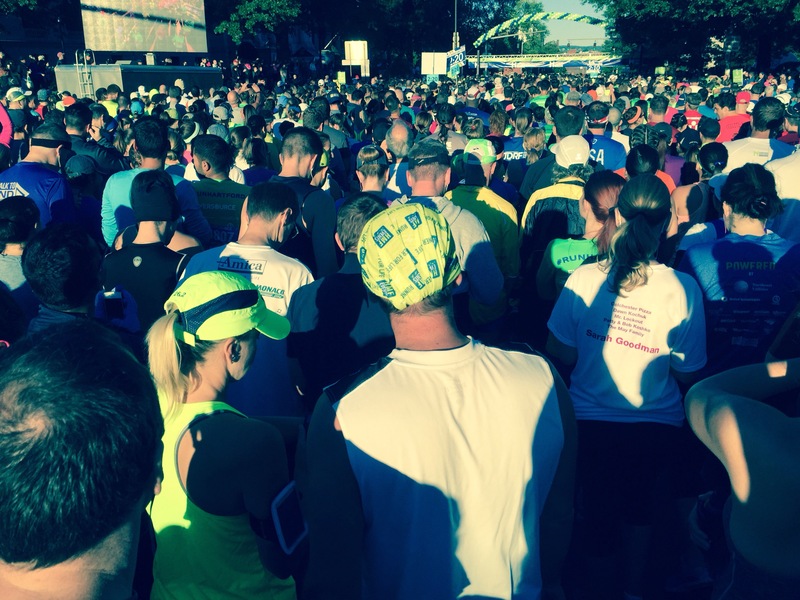 As we filtered into the herd of runners the national anthem started. It took my breath away for a moment. It always does. This part of my life is still so foreign to me in many ways. 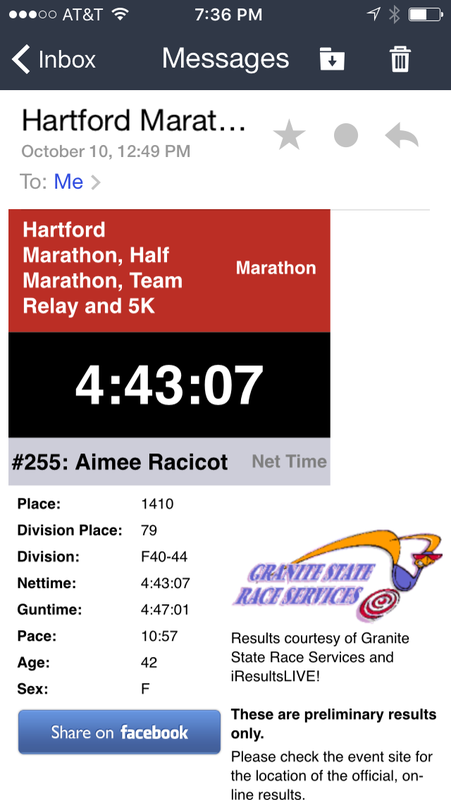 Aimee the runner is still not quite someone I identify with as part of me. Each time I line up at the start of a race I have this moment of confusion. “I’m not a runner.” “I don’t belong here.” And then the gun goes off and my legs override my mind and do what they know they are supposed to do at that moment. I gave Kate a hug and off I went. The full and half run together for about a mile before the course separates. We go left and the half goes to the right and we don’t converge again until the finish. I fell into a comfortable pace. I settled into my thoughts. And I ran. I ran a solid, consistent pace throughout the race. I smiled and grooved to my music. I high-fived the kids spectating along the way. Around mile 19 a woman running past me fell to the ground. I stopped to help her. I think it startled me as much as it did her. Thankfully she seemed like she was going to be ok. Then at some point before mile 23 I stopped with a man limping badly. I walked with him for a stretch and offered to get help, but he declined. 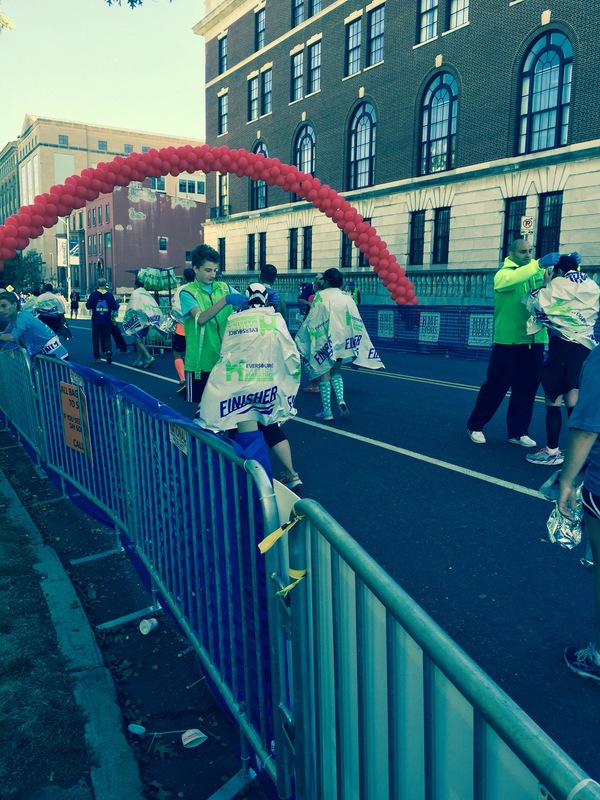 From there I ran to the finish at a steady pace. I knew I wasn’t going to meet my goal of a sub-4:30 marathon, but I also knew I had run my best race. Mile 25 was a bit of a surprise. We had to go up and over the river which meant an incline. At the end of the overpass we encountered another hill which felt like a mountain after running for so long. Finally I saw the Mile 26 sign and those last 2 tenths of a mile were a blur although they felt like they stretched out for a mile. I ran my heart out and finally came to the arches. I saw Kate and then crossed the finish line. The tears welled up in my eyes just like every marathon before. I did it! 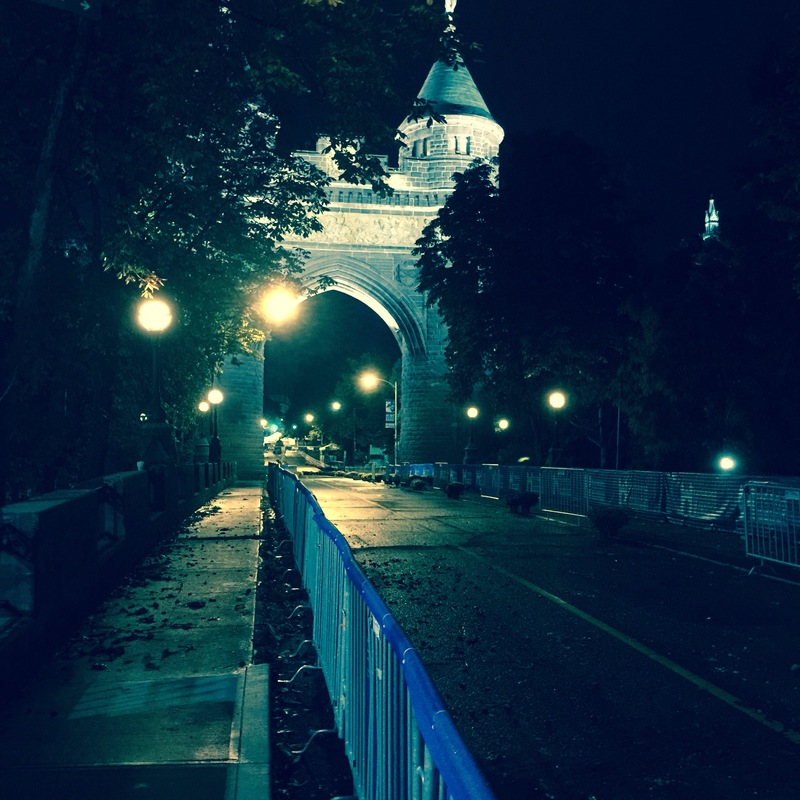 I took this photo of the finish line after I finished. Aren’t the mums pretty! Having run the Vermont City Marathon in May I was registered as a participant in the New England Double Header for running both Vermont and Hartford which really meant nothing more than double the bling! Kate finished her second half marathon!! I’m so incredibly proud of her. She had some challenges throughout her training and although she didn’t feel quite as strong going into this one as she did the last, she completed it and said she felt good along the way. She’s already planning for another in the spring. As for me, well I already mentioned I didn’t make my goal of completing the marathon in under 4:30. So here are my results. 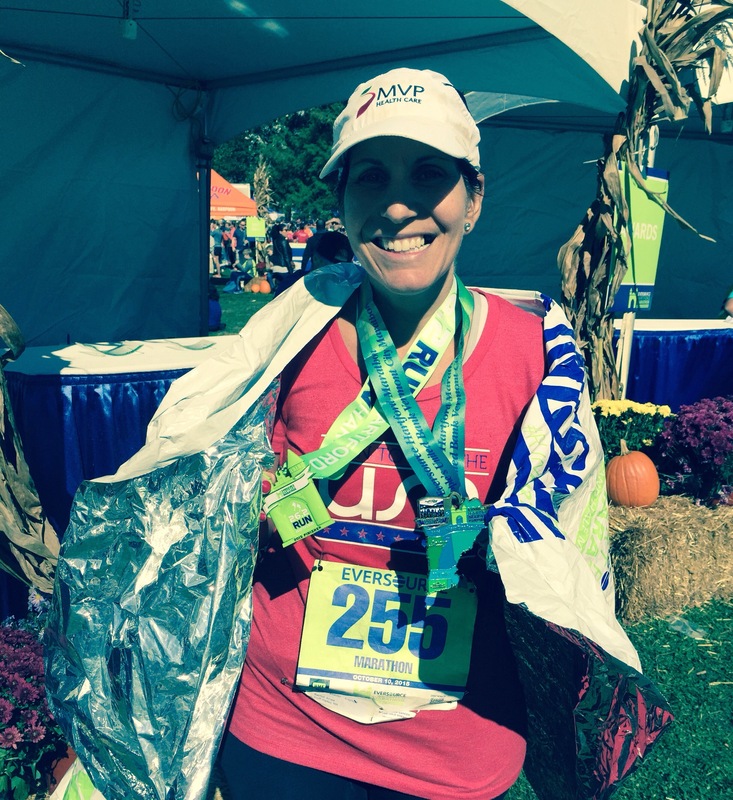 It may not be my best marathon time, but it is officially my new post-Achilles injury PR!! Small world…I think I know that woman you were talking wIith at your table…the one doing her first burlesque show! I still can’t believe that you ran for almost five hours straight…and to think over a year ago you were not even sure that you would be able to run again…I still remember all your issues with your achilles. So nice that time is the ultimate healer. 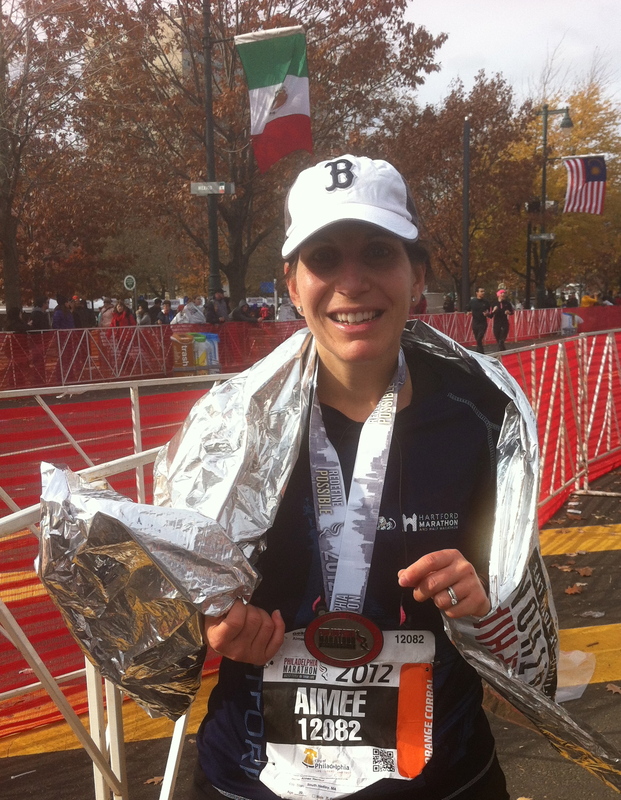 Can’t wait to hear about your next adventure…Runner Aimee! Manicures before a race sound like a tradition I should adopt — how fun! I pretty much get about 1 manicure every 8 years, so it would be a nice treat while being off your feet. 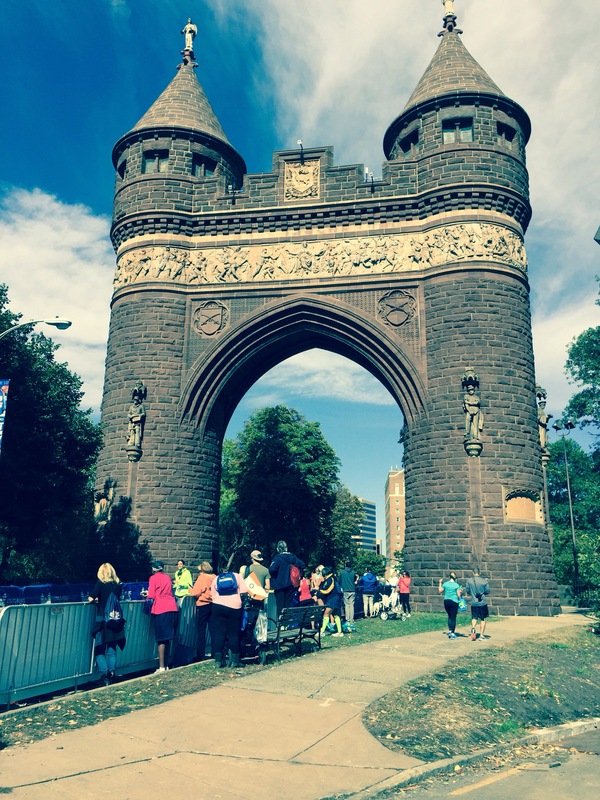 Sounds like Hartford puts on a great race, and I’m glad you had a solid, happy and strong performance — running your best race is all you can do any given day (and usually doing that is hard in and of itself, but you did it! ).